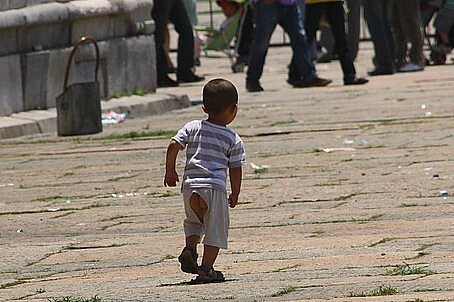 All over China little babies and toddlers are running around with their bums hanging out. It’s kind of hilarious. From Lhasa to Chengdu to Beijing, many people simply don’t use diapers at all. But, if you put an untrained, diaperless kid in regular clothes, there’s going to be a mess. So the solution? Tiny baby crotchless chaps. The littlest babies have a one-sie version: imagine a long bib, with strings that tie around the waist, and strings hanging down from the bottom corners which tie around the thighs. From the back it’s nothing but strings. Unfortunately I didn’t get any photos of these. It is socially acceptable for babies and toddlers then just do their business whenever/wherever they need to, so long as they are outside. However there comes a point when it is not so cute. Some might argue that when kids achieve a certain level of mobility and social awareness, they really should be wearing underwear in public places. A kid of about 4 years climbs on a bridge at the Forbidden City in Beijing. Maybe it's time for real pants? This is all very ecologically sounds potty training – disposable diapers are full of chemicals, most don’t biodegrade, and they produce a huge amount of waste. Good to see that China is doing something positive for the environment. We just got back from Beijing and we saw this everywhere… I have to say, this was kind of disturbing. While it may great for the environment, the child’s hygiene comes into question. The Forbidden City especially was so dirty! And I agree with you, four years old seems much to old to be hanging around with everything exposed. Baby clothes are nice specially if you use cotton based baby clothes. Cotton is the best fiber out there. ‘:;`.